The leader in the field, Emergency Medical Responder, Tenth Edition, provides clear, first responder-level training for fire service, emergency, law enforcement, military, civil, and industrial personnel. 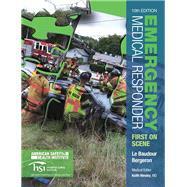 The new edition retains all of the successful features from previous editions and includes new topics and concepts that have recently become part of most Emergency Medical Responder programs. Using the new National Emergency Medical Services Education Standards for Emergency Medical Responders as a foundation, Emergency Medical Responder also includes the 2015 American Heart Association guidelines for Cardiopulmonary Resuscitation and First Aid. Critical-thinking First on Scene scenarios and From the Medical Director features offer readers a real-world perspective that will help them learn to think like EMRs. Chris Le Baudour has been working in the EMS field since 1978. In 1984, Chris began his teaching career in the Department of Public Safety–EMS Division at Santa Rosa Junior College in Santa Rosa, California. Chris holds a master’s degree in education with an emphasis in online teaching and learning as well as numerous EMS and instructional certifications. Chris has spent the past 30 years mastering the art of experiential learning in EMS and is well known for his innovative classroom techniques and his passion for both teaching and learning in both traditional and online classrooms. Chris is very involved in EMS education at the national level and served six years as a board member of the National Association of EMS Educators and advises many organizations throughout the country. Chris is a frequent presenter at both state and national conferences and a prolific EMS writer. Along with numerous articles, he is the author of Emergency Care for First Responders and coauthor of EMT Complete: A Basic Worktext, and an Emergency Medical Responder Workbook and Active Learning Manual for the EMT-Basic. Chris and his wife, Audrey, have two children and reside in northern California. David Bergeron was very active in the development of instructional and training programs for the emergency medical services (EMS) for more than 35 years. His early work included a front-row seat to the development of modern patient assessment and care inspired by the studies of Dr. R. Adams Cowley, Maryland Shock Trauma Center, Maryland Institute of EMS Systems, and Maryland Fire and Rescue Institute (MFRI). David’s work in instructional development for emergency medicine has included EMT-Basic, Emergency Medical Responder (First Responder), EMT-Intermediate, and EMT-Paramedic student and instructor programs. He is credited with writing the first comprehensive textbook for the first responder, for establishing the first behavioral objectives for EMTs, and for being the first to develop a full-course glossary for EMT instruction. As well as having served as an instructional technologist on leading textbooks in emergency medicine, David was on the teaching faculty of the University of Maryland, Longwood University, and numerous community colleges and schools of nursing. His publications include textbooks that have been translated into Spanish, Portuguese, French, German, Italian, Lithuanian, and Japanese. David passed away on April 10, 2012, after a long illness.